Experience knows that when the air bags deploy it’s already too late. You're street smart. While driving 70 mph on a crowded highway you notice a sticky pattern forming in traffic ahead. With barely a thought you drop back a few car lengths. Cars ahead swerve wildly, but the situation dissipates without mayhem. What was it that tipped you off to the danger that split second before the others? Was it your car’s automated collision avoidance system? More likely it was that priceless intangible — experience — a.k.a. street smarts. Like collision avoidance systems in cars, email providers' threat algorithms and your computer’s malware blockers work full-time to protect you. Even still, phishing attempts can get through. But if you're alert you’ll pause and you won't take the bait. Yesterday a message seeming to come from Apple appeared in my Inbox. But, something wasn’t right. I junked the message. Why? Apple is safe. Right? 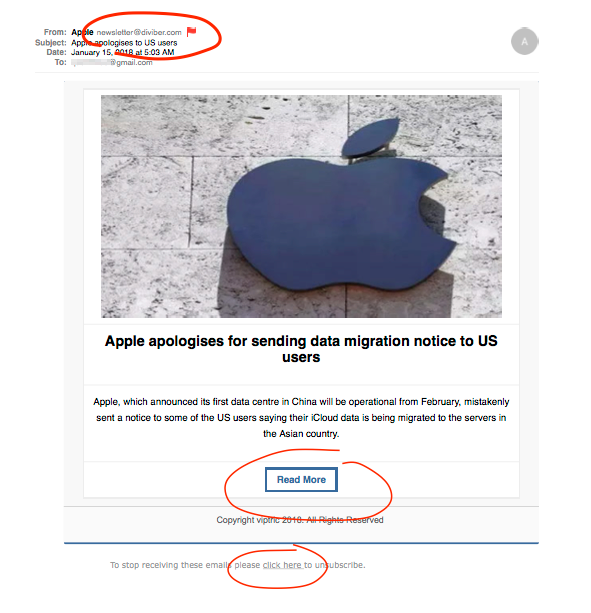 The photo and subject line are odd, the sender and reply to addresses aren’t at Apple, response link addresses aren’t at Apple either, message phrasing is janky, "Copyright viptric" is fake. I could go on. Gmail’s algorithm didn’t block this phishing attempt. The phishing attempt dodged malware protection. The spam filter let it into my Inbox. The message said it was from Apple. But my inner wingman said "don't take the bait". Care for your digital devices and immediately install legitimate software updates. Be wary of all email messages, instant messages, social media messages. Steer clear of gossip sites, clickbait, and too-good-to-be-true offers. Don't seek and never accept online or telephone tech support from anyone you don’t personally know and trust. Stay alert while cruising the information super highway. Click #phishing in the sidebar or at the bottom of this blog post for more info about this topic.